Matter in the corona and solar wind is derived from the outer convective zone (OCZ) of the Sun. Isotopic abundances of the less volatile elements in the solar atmosphere are probably very similar to terrestrial, lunar and meteoritic abundances. From such elements it is possible to infer the amount of isotopic fractionation under varying conditions in the solar wind source region. For many species, the solar wind provides the only source of information, which is important for many cosmochemical and astrophysical applications. Knowledge of the isotopic composition of the OCZ will yield information on the early solar nebula and the history of the solar system. The CELIAS solar wind mass spectrometer (MTOF, Mass Time-of-Flight sensor) has unprecedented mass resolution for solar wind composition studies, and has already measured rare elements and isotopes that were previously not resolvable from more abundant neighboring species, or were not previously observable at all. 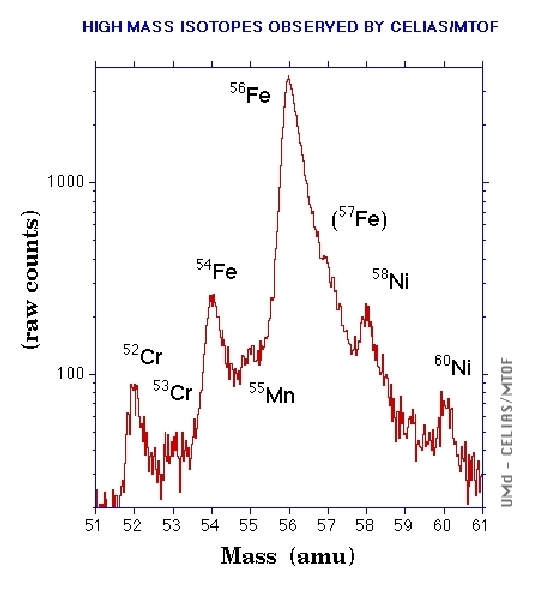 The MTOF sensor is routinely measuring isotopic abundance variations for several elements (neon, magnesium, silicon, sulfur, argon, calcium, iron, and nickel), some of which have never been previously observed in either the solar wind, solar energetic particles, or spectroscopically. Among the new solar wind isotopes are those of silicon, sulfur, calcium, chromium, iron, and nickel. Other isotopes are being measured with a much finer temporal resolution than previously available (on the order of minutes/hours instead of months/years). Previously, neon and argon solar wind isotopic measurements were available only from foil measurements collected during the Apollo lunar landings - clearly a limited data set! The first magnesium isotope measurements have been reported by MTOF's sister sensor WIND/SMS/MASS. 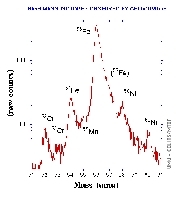 This image shows isotopes of Chromium, Iron, and Nickel.